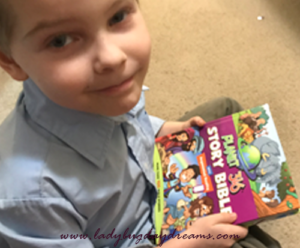 Bible storybooks are a great way to introduce the scriptures to young children. As our society becomes more and more technologically inclined, apps and programs come out that can be a distraction, though. 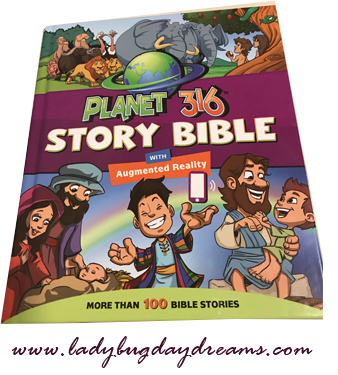 Planet 316 and WorthyKids/Ideals have combined to create the Planet 316 Story Bible and the companion Planet 316 Story Bible App, a physical Bible storybook that works simultaneously with an app to create a super fun, “augmented reality” experience. The way it works is this: purchase your book (the cover price is $18.99, but when you click the “buy” link, it takes you to Amazon where you can get it for $14.96 as of the date of this post) and download the free app, which is available for both Android and Apple products. I downloaded it to both my iPhone and iPad, just so we’d have options in case one or the other wasn’t available (dead battery, for example). The first time you use the app, you’ll need to grant it access to your camera, otherwise it can’t “read” the images on the book’s pages. Once you have both, open the book and aim your device’s camera shutter at the picture. On the screen, you’ll see the Bible come to life! Parts of the pictures appear to literally jump off the page, music plays, and most of the time the characters even talk. It’s really neat. I used this with both Small Fry (5) and Dragonfly (2). It was our go-to bedtime story for a while. I would read the pages to them, then we’d do the augmented reality portion for that page. The kids would take turns tapping the characters (which is how you make them say their lines). Several of the stories run just one spread, but many of them take more than one also. 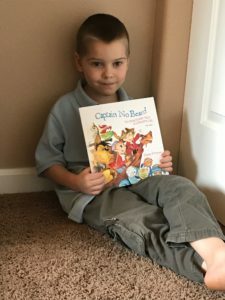 In a single night, it was easy to read 4 or 5 stories without it seeming like too much for a bedtime story (not that there’s ever such a thing as too much scripture, but you know what I mean). My kids have really loved this product. It combines two of their very favorite things: being read to and getting to use the iPad. I really enjoyed it too. The augmented reality technology is really fascinating, and it really helps to bring the stories to life for young children. Sometimes the characters’ words are quite comedic (for example, on the day he was created, Adam says, “It’s my birthday!”), but sometimes they’re somber enough for the mood of the story they’re in. Adding that little bit of life to the Bible really helps kids to be able to understand that those things actually happened, too. 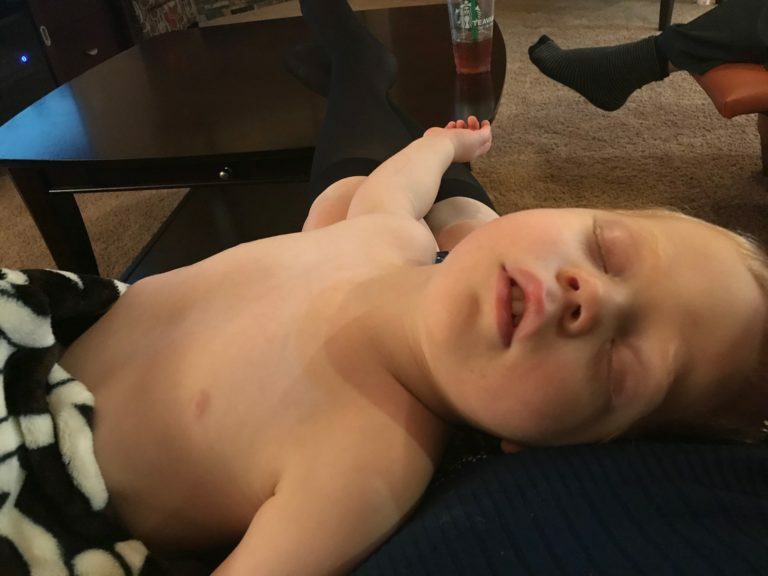 Even though they only speak a sentence or two at a time, something about having a voice besides Mom saying the words gives kids a sense of reality. One of the best features is that once you have the app downloaded, you don’t need internet in order to run it. 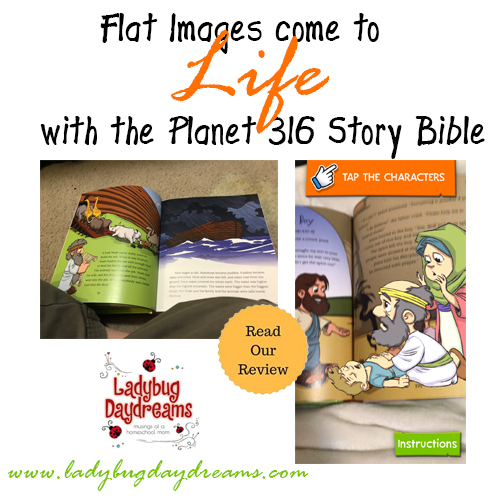 All the stories are contained in the app itself, so if you find yourself unable to connect to internet for one reason or another, your Planet 316 Story Bible App will still work. As much as we loved it, there are two things I would change. First of all, it was a bit difficult to get the iPad far enough away to be able to see the entire image (on the screen) and not be standing over the book. This is very likely a camera issue, not an app issue though. I just would love to have the option to zoom out. The second thing is that it can be quite difficult to run both the book and the app-running-device with just one person. It was okay for me (just okay, not great) because I was reading to Small Fry, who is old enough to help. But the book, being a brand-new hardcover book, didn’t like to stay open unless you (someone) were holding it. Having to do that while also aiming the camera at the book proved to be difficult most of the time. The Bible being available in a spiral-bound edition would eliminate this problem completely, and that would be a very good thing, I think. Despite those two issues, they’re not enough to keep us from using this product. The kids love it, I think it’s really cool, and they’re getting a reasonable Biblical foundation from the stories. That’s what matters most of all. 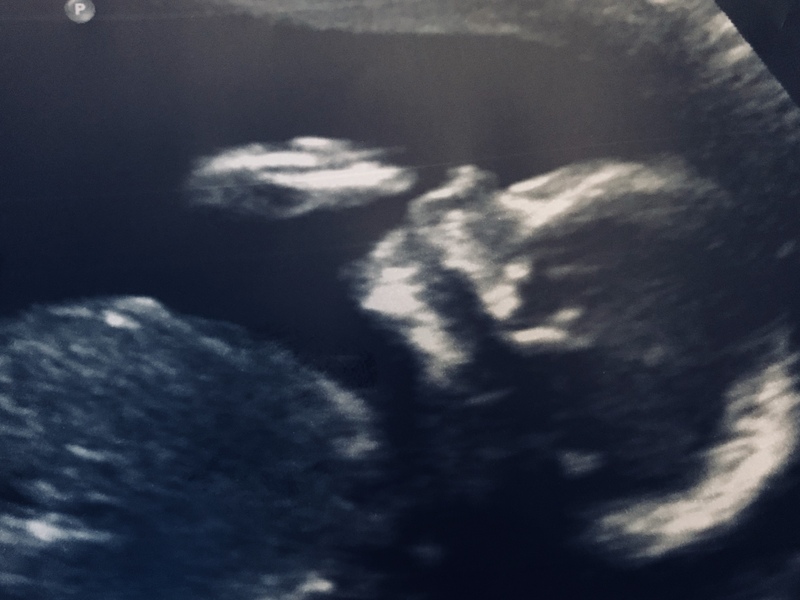 We had our first ultrasound of the new baby yesterday. Everything looks great! They were unable to get images of the heart because of baby’s position, so we’ll be going back in a month to recheck. Do you have a student who thrives on worksheets? Do you need a resource from which to get tests for your child? Or would you prefer to write your own tests but not have to deal with the formatting in a word processor? 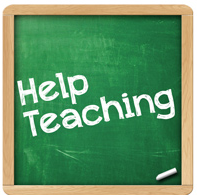 Then HelpTeaching.com just might be the right fit for you. For the past few weeks, I’ve been able to review their Help Teaching Pro to do some of the things I just mentioned. My older kids have plenty of schoolwork to keep them busy, but for Small Fry (Kindergarten), I felt like we needed something more, which is why I asked to review this product. After looking over the website, I determined that there would be lots of options there for his age, and I was right. It’s been a true blessing to have these premade worksheets the past few weeks so all I have to do is print them out and teach him the concepts. HelpTeaching.com makes it so easy! I initially expected that my son would be fairly slow going with the worksheets (since this would be his first experience with them), so in my first perusal of the website after getting my access code, I decided to print off 5 language arts worksheets and 5 math worksheets, figuring that would get us through one week of classes. Boy was I wrong! 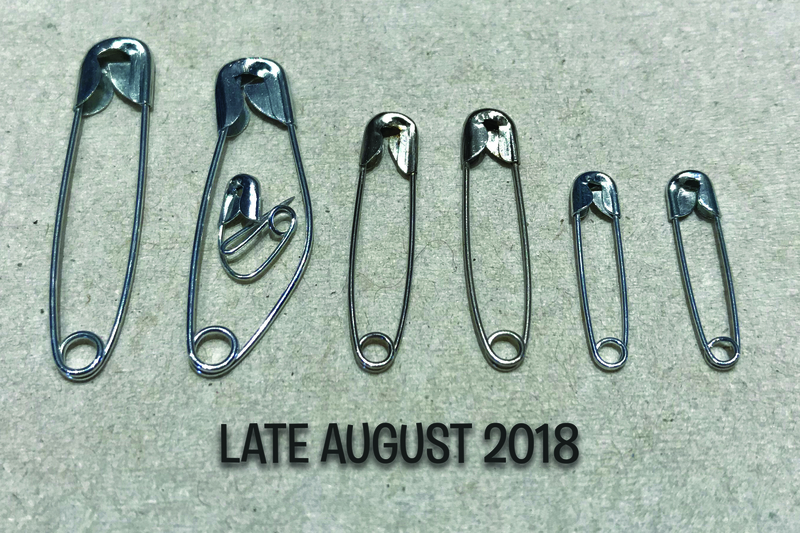 My 5-year-old loved these, and he burned through all of them on the very first day. So that night, I hopped back on the site and found more to get ready for him. 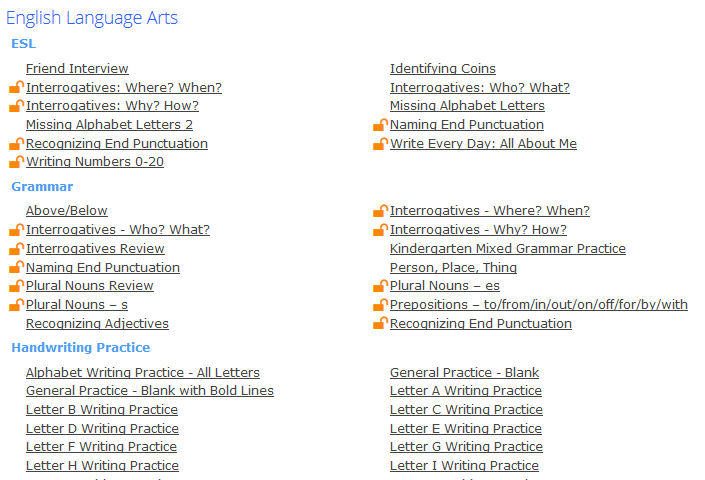 This screenshot shows a sample section of the website so you can see how the worksheets are organized. Those with the lock icon are available only with a paid membership; those without can be accessed with just the free account from HelpTeaching.com. The site is very organized, which I appreciated. I was easily able to narrow my search down to exactly what I wanted because all of the worksheets are arranged by both subject and grade. By choosing the “Kindergarten” age level, I was taken to a page with hundreds of choices in all of the major subjects. Because we already had a science curriculum we were working on together, I didn’t pay much attention to those, but I looked at nearly all of the options for both language arts (including things like word building, reading comprehension, and sight words plus many more) and math, and over the past few weeks Small Fry has done many of them. I opted for the last choice, just because I was able to control the print quality (black and white, ink saver mode, double sided when appropriate) better. Once the worksheets were printed, I put them all in a folder for safe keeping. I stored blank worksheets on the left and completed worksheets on the right. It hasn’t been a perfect solution (sometimes the folder gets misplaced, the completed worksheets don’t get put in at the end, and the math and English worksheets are all mixed together), but it’s generally been fine. It seems that I’ve forgotten to take pictures of the worksheets that Small Fry has completed; I assure you, he’s done many of them. 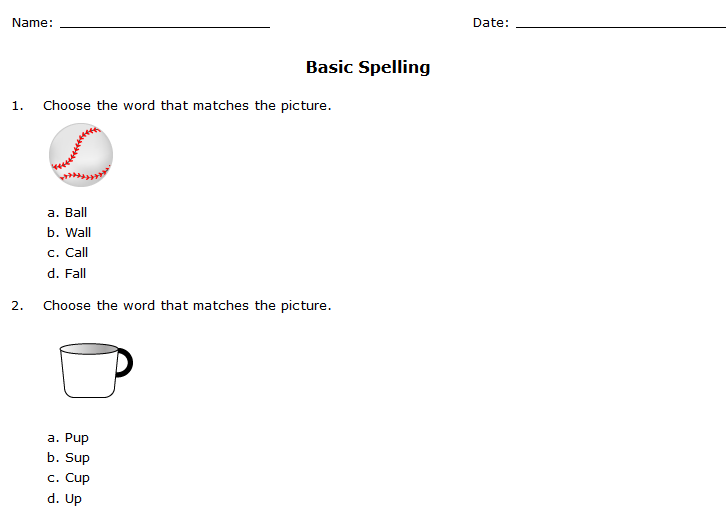 Please forgive this oversight and use the sample image at the left to see what kinds of worksheets are available. So that’s how I used the site. But what about those tests I mentioned in my opening paragraph? Well, that’s easy too! Just click on the Test Maker button at the top of the page, and you’re taken to a page with lots of options. You can fill it in completely with your own questions, you can populate the test with questions exclusively from the HelpTeaching.com library, or you can mix and match. How cool is that?! Overall, I’ve been very happy with our Help Teaching Pro membership. I will definitely continue to pull worksheets for my boy for the foreseeable future; it’s too good a resource to not use. 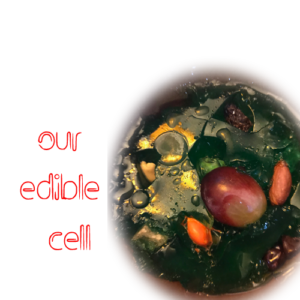 Munchkin, Small Fry, and I have had so much fun the past few weeks working on our new anatomy course – Exploring Creation with Human Anatomy and Physiology from Apologia. We were blessed to receive the full set, including the text book, the notebooking journal, the junior notebooking journal, and the mp3 CD. I love that we have both of the notebooking journals. The regular journal is perfect for Munchkin (a young 6th grader) and the junior version is just right for Small Fry (a typical kindergartner). Not having any kids in between those two means they can’t often do any lessons together, but this one was one that they both are enjoying immensely. As many in the homeschool community know, Apologia is one of the biggest providers of faith-based science curricula (besides their other offerings). 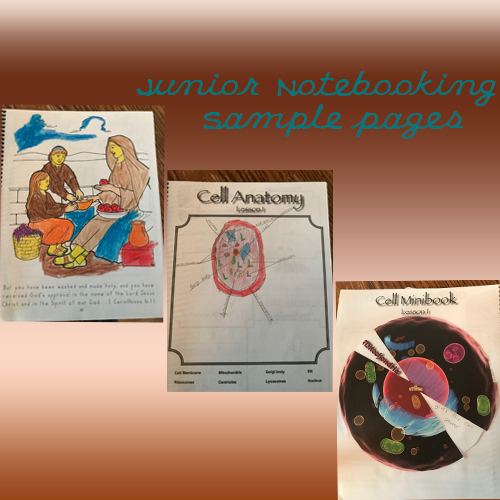 They have a multitude of options, and their “Exploring Creation” series (of which Anatomy and Physiology is a part of) is geared toward the K-6 crowd. Each title in the series goes in-depth through an aspect of elementary-level science with honoring God and his creation at the forefront of each topic. In each notebooing journal, there is a suggested schedule to follow, which has you “doing” science twice a week. Being a bit unsure as to how else to run things, I started with this as my baseline. Each day starts with some reading. Older children could easily do this on their own. Because I was also working with a kindergartner (who doesn’t yet read on his own), I decided to read the text aloud to both of my boys. We’d gather up the three books at the dinner table and dive in. The reading is broken up into manageable chunks, which is good for both the reader and the student(s). After reading roughly 2-3 pages, there’s a place (printed in blue in the textbook so it’s hard to miss) to stop and have your student narrate back to you what they just learned. I really liked this aspect because it helped me to make sure that the boys were understanding what was being taught. They both did a very good job of being able to remember the things in each section, which really pleased me. They may not have remembered the exact names of things, but they remembered enough of the basics to satisfy me that they were, in fact, learning the material. In case you’re not really digging the idea of reading an entire textbook aloud, or you student isn’t much of a reader, you can get the companion mp3 CD. The CD opens with an introduction explaining what you’re about to hear and how you should use the audiobook – namely, with the textbook in front of you because while the text itself is presented in the audiobook, things like the experiments are not. Where those show up in the text, the narrator (who happens to be text author Jeannie Fulbright) just tells you that a “Try This” exists there and that you should stop the CD to look over (and hopefully do) the experiment. This intro is given by a man with a pleasant speaking voice. After the introduction is over, the text begins right at the opening page. The author reads her book with great diction and expression. It’s obvious from her reading that she’s very passionate about her work, and that’s a good thing. The thing that surprised me the most about her reading was how young her voice sounded (but that’s not a bad thing!). The CD is split up into tracks based on the lesson number and topic heading within that lesson (if I was reading the mp3 reader on the computer correctly). That makes it quite easy to navigate right to where you need to go on lessons after the first one, which is a nice feature considering each lesson is broken up into four days of work. One thing to know about the CD is that it’s not a regular CD; it’s an mp3 CD, which means it won’t play in a traditional CD or DVD player. You need something with mp3 capabilities (in our case, Will’s laptop), which is the main reason we didn’t use it. His computer is rarely available for us to use for school because he needs it for work most days. After this reading (or listening), there is a page or two in the notebooking journal to work on. In the Junior Notebooking Journal, this is usually coloring pages. I let Small Fry color these pages while he listened to me read – I know I have an easier time focusing if my hands are busy, and he’s proving to be the same (actually, all of my kids are). 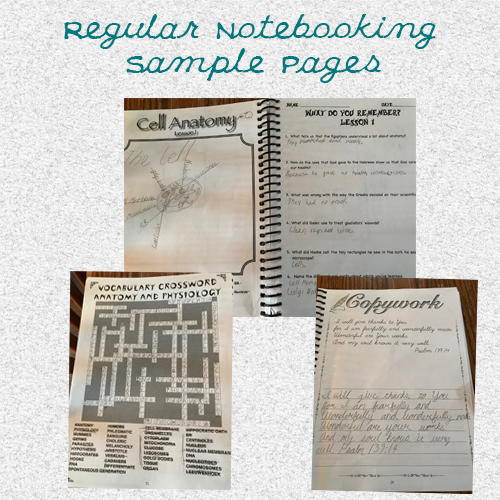 In the regular Notebooking Journal, it was pages to make note of what was learned (which helps to reinforce concepts beyond just the oral narration). Then there was more reading and narration (some days). 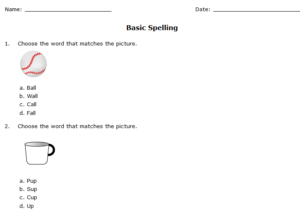 Sprinkled throughout are also experiments, so even if/when there was a lot of reading, there were some really fun activities to break it all up besides just the “worksheets.” These experiments are described right in the text, so there’s no need to try to find things that correspond with the lesson you’re working on. 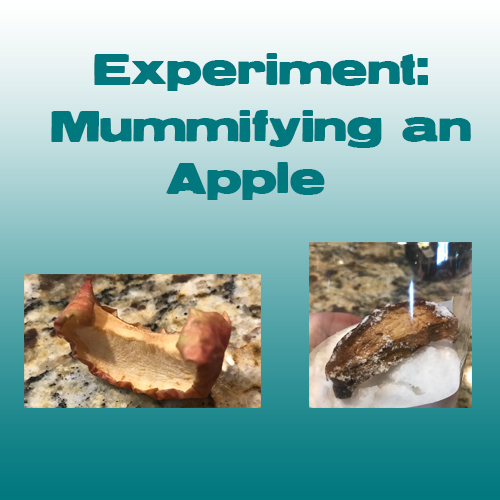 You will need some supplies for these experiments, but they’re nothing super abnormal. For example, of the first two activities, one required plastic cups, apple slices (one apple’s worth), salt, Epsom salt, and baking soda. Stuff that a lot of people have on hand anyway, and even if you don’t, they’re quite inexpensive in the regular grocery store. The second one only required a zipper-top baggie and a bit of water (to make a magnifying glass of sorts). Easy. 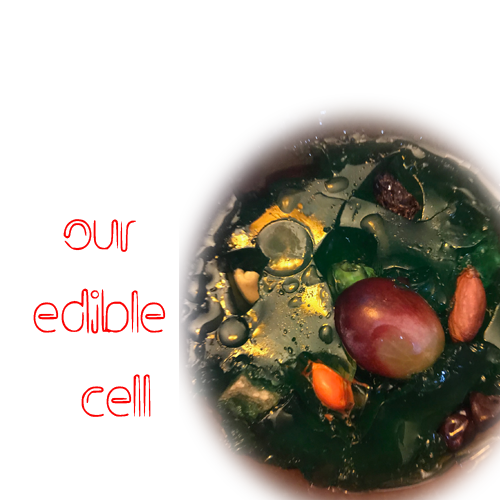 If you’re concerned about your ability to get all of the supplies in time for the lesson, you can find kits online for this course that include every single thing you need for each experiment in the book, all sorted out by lesson. We didn’t get one of these this time, but it was definitely something I considered. In the end, we opted to just pick up the stuff as we needed it, which hasn’t been a problem yet. And if you don’t get a kit and do find out that you’re short on supplies for an experiment, it’s not a major deal to skip some and just do the ones that work into your home and family. This is what we ended up doing (though I did make sure we were able to cover as many of them as possible). Included in the front of the textbook was an experiment page that included the basic questions – what is the procedure for the experiment? What do you expect to happen? What actually happened? 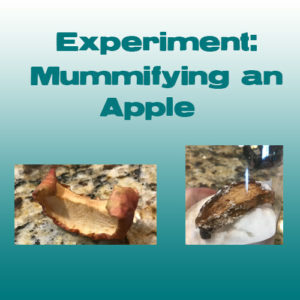 What did you learn from this experiment? For each experiment, I photocopied this page for each child. I had Munchkin do the page on his own and I let Small Fry dictate to me his answers. When you finish up the lesson reading (on day 4), there are a few other pages in the Notebooking Journals that you have the option of having your child work through, including things like mini books, copy work, and crossword puzzles. We did most of these because besides reinforcing what was learned over the past two weeks, they were just fun. As I’ve mentioned throughout different points in this review, we have really enjoyed this science course. 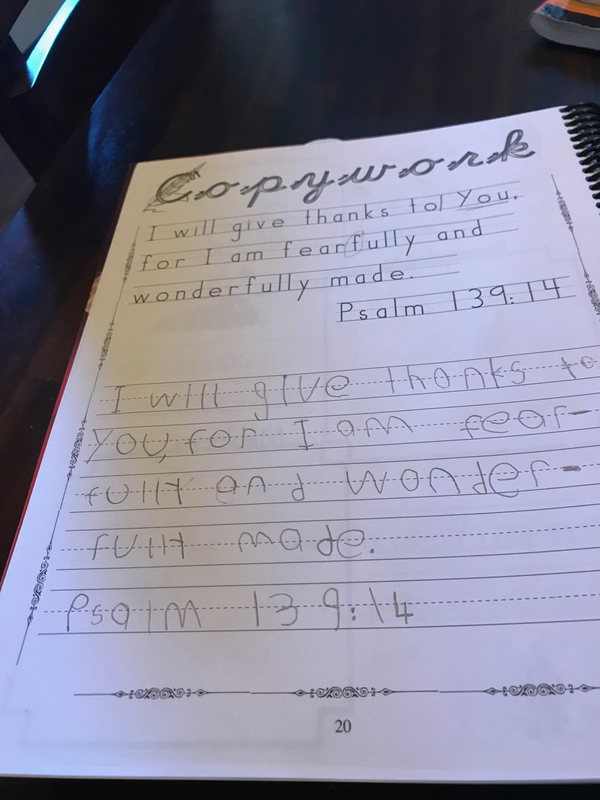 I love that my kids are learning all about their own bodies and how they work, all under the heading of “God made you this way; isn’t it amazing?” The kids, especially Small Fry, have really like learning about human bodies (their favorite so far is the chapter on bones). I think Small Fry really thrives on the consistency of the lessons – knowing that it will happen a couple of days each week is really good for him. He craves a schedule, and has really thrived on having one in these lessons. Munchkin is similar, but at the same time old enough to a) schedule himself what he needs to do each day and b) feel lucky when things work out to where the school day is shorter than expected for one reason or another. Bottom line: Will we continue to work through this class now that we don’t “have to” (per our obligations as curriculum reviewers)? Yes! I can see how my kids are thriving on these lessons, and I have no desire to take them away from the boys. We will absolutely be continuing this course. 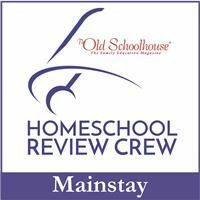 There are lots more reviews of Exploring Creation with Human Anatomy and Physiology on the Homeschool Review Crew this week. 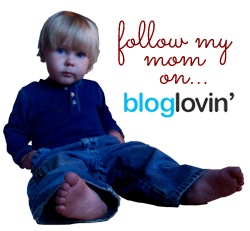 Make sure to click the banner below if you’re interested in reading more thoughts from real-life homeschool moms and kids on the class. The little boys have been having so much fun together lately. It’s been really great watching their relationship develop beyond “just brothers” and truly into “friends” as well. This picture shows just one such incident. 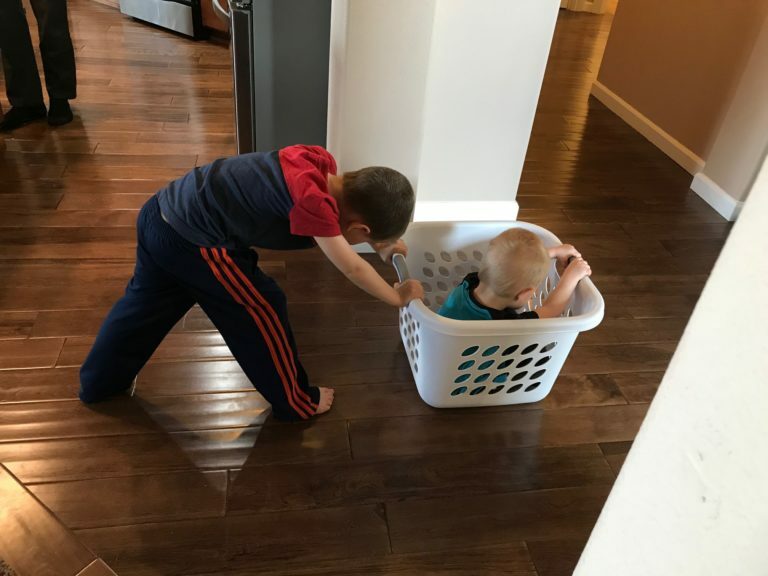 Dragonfly, being a toddler, loves to sit in the laundry basket and pretend it’s a car. Small Fry took it upon himself to play with his little brother and push him all over the house. This is a privilege I don’t get very often anymore as Dragonfly is almost 2 1/2 years old. Therefore I relish the opportunity to snuggle him to sleep anytime he’s calm enough. When my older kids were much younger (around the time when they were in K and 2nd grade – Small Fry was just a tiny baby back then, and Dragonfly wasn’t yet even a thought), we loved doing unit studies together. This was before my time with the Homeschool Review Crew, and before I really knew anything about homeschooling that didn’t consist of buying workbooks from Lakeshore Learning and having us just work through the set each year. (They hated that, by the way.) Because I knew nothing about doing school any other way, or where to find resources, when I first learned about unit studies I was very intrigued. I “wrote” a few of my own unit studies for us to do, always revolving around a book. We did one on penguins with Mr. Popper’s Penguins as the backbone. We did one on newspapers using Henry and the Paper Route as our basis (that one was my favorite – we did so many cool things, including touring the local newspaper office and making our own paper). That time was one of my absolute favorites as a homeschool mom. So when the opportunity to review a new (to us) set of unit studies designed for older grades (5-8) arose, I was interested. These unit studies, from Creation Illustrated, have been a neat way for the big boys to remember the early days of our schooling careers (now that they’re older, a strict unit study option isn’t always sufficient). 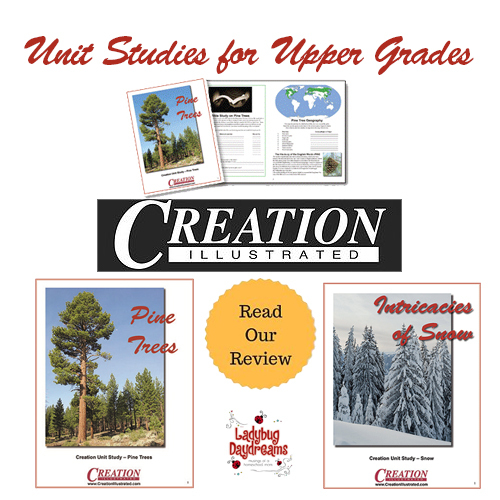 For this review, we received two unit studies: Pine Trees and Snow Unit Study. We focused on Pine Trees because we have lots of them where we live. In addition to the unit studies, we also received access to Winter ’18 Digital Edition and Fall ’17 Digital Edition of Creation Illustrated’s magazines. Because Seahawk is in 8th grade and Munchkin is in 6th grade, they both fall into the suggested age range for these unit studies, so I had them both work on it. I started by downloading the files and printing two copies – one for each child. The file is only 16 pages (including the answer key), so it wasn’t a hardship to print two copies. I printed the cover of the study on its own page and then did the rest double-sided. Each of the aspects of the unit study is presented separately, and it didn’t take very long to work all the way through it. The boys worked on one subject within the unit study each day or two, depending on how long or involved the subject was. Subjects included are Vocabulary/Spelling, Bible, Geography, Science, Math, Writing/Penmanship, Art, and a Puzzle. There is also a full page of reading supplements and educational video links to help further understand the topic at hand. We just started at the beginning and moved through in order, and didn’t use many of the links. The first page was Vocabulary, and while the boys knew several of the words, there were several others that they didn’t, so I helped them find the definitions. This lesson was two pages. The first page was a list of the words with space for students to write the definitions; the second was the definitions and the kids wrote in the words. We did this over two days. Moving on to the Bible portion, there is a list of Scripture references that all deal with pine trees of some sort. Students are instructed to read the verses, determine what the tree in the verse was used for, and then whether it was a pine or a fir. There are also “extra credit” critical thinking questions on this page. Geography is fairly straightforward in a study like this – what kinds of pine trees are located where in the world? Science is similar, teaching students to identify different types of pines based on their needles and cones. Math includes several story problems around pine trees, including one that we used for real life learning a year or two ago: determining the height of a tree using right triangles and a known height (a person, for instance). Writing and penmanship go together. Rather than being copywork, students are instructed to write an essay based on what they learned using their very best handwriting. For art, similar story – students draw a picture of their favorite pine tree, using what they learned to make sure the needles and cones are scientifically correct. The last bit is a word find puzzle for fun. The Snow Unit Study has many of the same components (subjects), including activities that are much the same as in the Pine Tree study. I will say that I like the Bible study better in the Snow Unit Study though – it has students do similar activities (read the Scripture that mentions snow, and then determine whether that usage is literal or symbolic), but then it goes a step further. 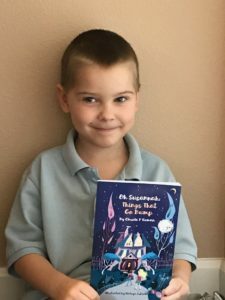 Kids are instructed to choose their favorite verse from the selection and memorize it, and even offered the idea of making a bookmark decorated with snowflakes showcasing that verse (either to keep or bless someone else with). The science portion talks all about the water cycle, which is a good thing for students to grasp and goes perfectly in a unit study on snow. There’s also a hands-on project on the science page to make snow-looking crystals. We don’t get much snow around here, which is why I chose to focus on Pine Trees for this review, but I definitely think my boys would find the Snow Unit Study really neat, so we’ll definitely be doing that one soon as well. There is a lot of good information in this unit study, but I’m not sure it’s quite as involved as the ones I made up when the kids were little. I wouldn’t feel comfortable using this as a core curriculum for the upper grades, but it’s a really fun supplement/extra little something if you want just a little bit of information on a specific topic. The whole thing could easily be done in a week or two, depending on how much your student does each day, but in my opinion you would still need to do “regular” studies as well. This wouldn’t be enough to be an “everything school day” like the unit studies I did when the big kids were small. The digital magazines (which admittedly, I haven’t spent tons of time with) look really neat. They’re chock full of gorgeous pictures and great articles reminding us to appreciate and glory in God’s creation. Each article is riddled with Bible verse pullouts, driving their points home. It really is a beautiful thing. Purchase of any of the unit studies (there are eight altogether, not just the two I mentioned here today) automatically includes a link to the digital magazines, or you can purchase just the magazines for $4.99. On top of the articles being inspiring, the pictures would make amazing collage components (or good pieces for any other art project you have in mind). From the little I’ve seen so far of these magazines, I’m very impressed with them. 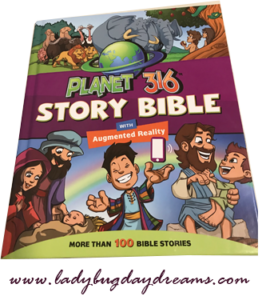 Sixty members of the Homeschool Review Crew are reviewing Creation Illustrated this week. Some are focusing on Pine Trees (like I did) and others are focused more on the Snow Unit Study. Make sure to click the banner below for more information on both of these unit studies. The little boys (ages 5 and 2) and I have had the pleasure the past few weeks of reading a few books by Carole P. Roman. We were able to choose three books from the Carole P. Roman books and collections. I opted for one chapter book, one fun picture book, and one learning picture book for us. All of the choices have been huge hits with my children, and I’ll take a few minutes here to discuss each one. For our chapter book, I picked Oh Susannah: Things That Go Bump ($6.99 paperback, $0.99 Kindle). This book is about 40 pages, divided over 10 chapters. It tells the story of a little girl named Susannah who is going to be having a sleepover at her friend Lola’s house. The only problem is that Lola lives in a haunted house! Not really, but it is a big, old, creaky house, and Susannah is afraid to go there. Over the course of the novel, Susannah comes into contact with characters (her parents and other friends) who help her see the world – especially the scary parts – in new ways. Susannah is very skeptical, and the first bit of her time (2 or 3 chapters) at Lola’s is just as frightening and nerve wracking as she expects. But by the end of the book, she learns that some things aren’t always as they seem. I’m glad I had a chance to read this book (we read 1-2 chapters a day, depending on length) with Small Fry. Even though a few sections were rather creepy and scary for him, I feel like it helped him learn that it’s better to talk over your feelings and push through things that you’re afraid of (within reason). The fun picture book we chose was Captain No Beard: An Imaginary Tale of a Pirate’s Life (volume 1) (currently on sale for $5 paperback, $1.99 Kindle). Because Captain No Beard is a typical picture book, we read it in one sitting – and have since read it dozens more times! Captain No Beard is the story of a boy, his cousin, and a crew of animals out on the open sea. Together, they learn some pirate words, spot land, rescue one of the members from falling overboard, and have a conversation with a mermaid. There’s a fun reveal at the end that completely caught my boys by surprise (though a grownup should be able to guess is based on the title of the book). They had so much fun with this book; I don’t think they stopped laughing once through the whole thing. I loved reading them a book that they so clearly loved hearing. They will love to get another volume of this series one day soon. And yes, Dragonfly did listen with us even though he’s not in the pictures. He’s not feeling very well this week and was being a bit stubborn at photo time. The final book we received was If You Were Me and Lived In… France ($9.99 paperback, $1.99 Kindle). Because we’ve been studying French as our foreign language for several years (less than we should recently, since my laptop went kaput several months ago), I’ve wanted to get this book for the kids for a while, but it hadn’t happened yet. I’d intended for the big kids to read it on their own, and while they did we also had a side benefit that I hadn’t anticipated with this title: the little kids love it too! Just this morning, Dragonfly (2) brought it to me and asked to “read.” Of course I obliged! From nearly the first page, he was even repeating some of the French words after me. 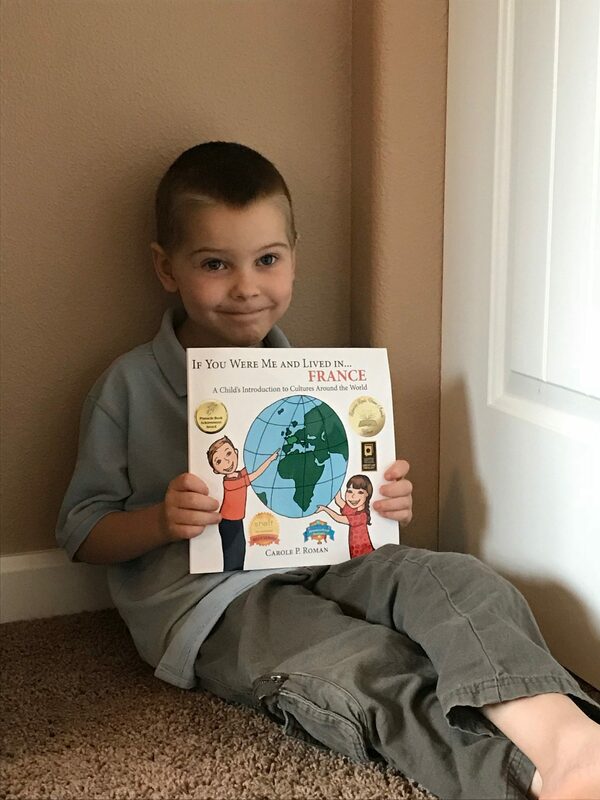 This book, which is part of a series that teaches children about different cultures all over the world, does a good job explaining what things are like for French children. (At least I think it does. I’ve never actually been to France to be able to compare.) It tells about the capital city of Paris and the Eiffel Tower. It takes you on a trip to a boulangerie (bakery). It describes he names that are popular in France, for both boys and girls. It just generally gives a lot of good, but fun, information about the subject. My only critique of this one is that the pronunciation guide isn’t always super precise. Some of the words are given the American pronunciation rather than the French pronunciation, but others are given the French pronunciation. For example, boulangerie is given its French pronunciation (boo-LAHN-jair-ee), but Eiffel is given the English/American pronunciation (EYE-full). The French pronunciation of Eiffel is ee-FELL. Generally speaking, that’s fairly minor (because I know enough French to have said the words correctly to the little boys). 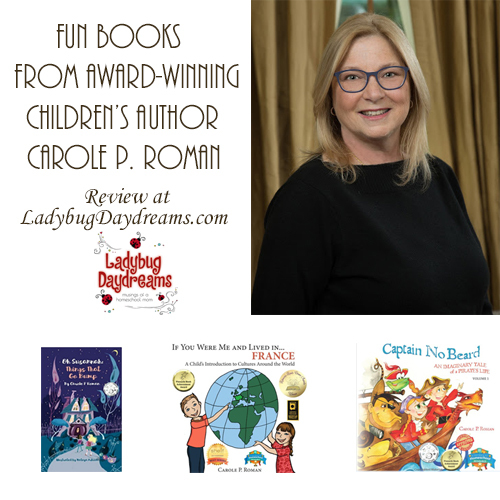 We have had such a good time with all three of these books by Carole P. Roman. 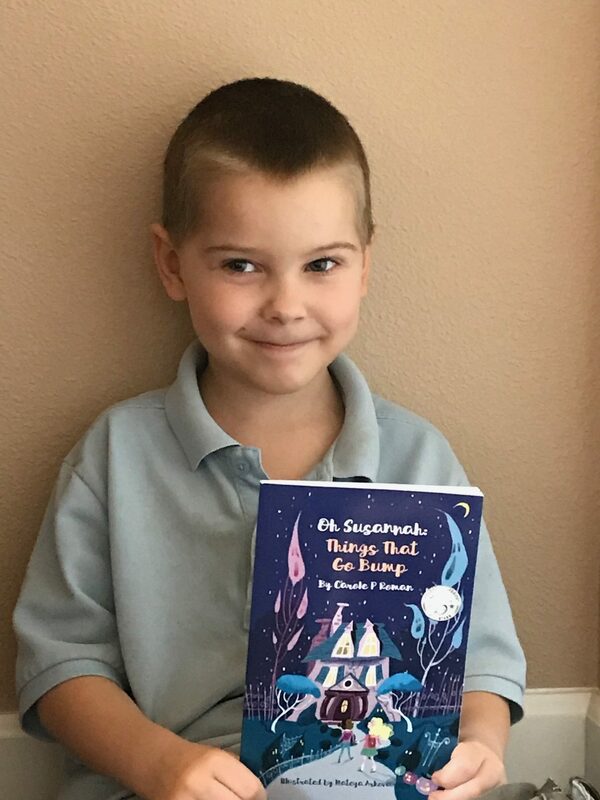 Her books are super fun, even those that are more educational than “just for fun.” I am so glad we were blessed to receive these books for review. Paul’s writings were vital to the spread of early Christianity, and it was Luke who helped him get the word out. 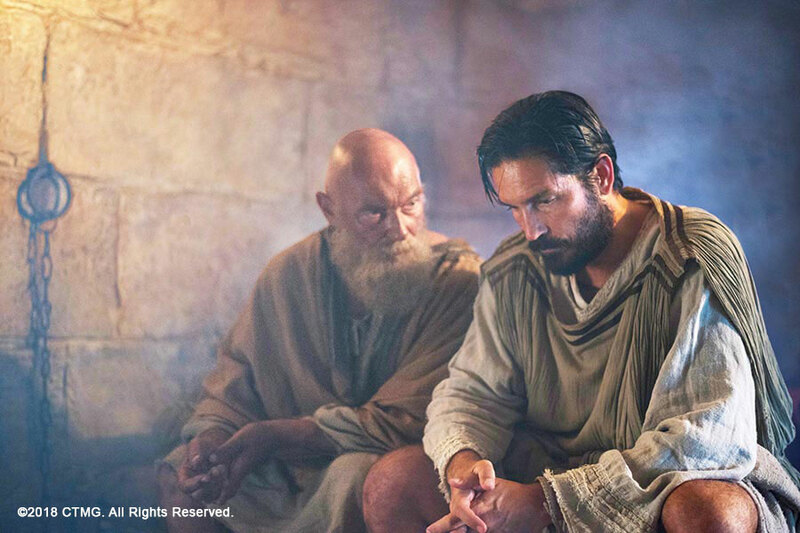 In a new film from director Andrew Hyatt comes Paul, Apostle of Christ, the story of how Paul (in prison) and Luke work tirelessly to get the message out. Disclaimer: I haven’t seen this movie yet as it doesn’t open until tomorrow. The information I’m sharing is from the website as well as the promotional material I was provided. The filmmakers took great pains to keep this film as biblically accurate as possible, using only scripture as their source material. After having seen a few Bible story movies in the past few year that were definitely not biblical (*ahem* Noah *ahem*), I’m really impressed with this statement. This historically accurate film brings to life two very different men, bonded together by their love for Jesus. They realize separately that the city of Rome is being overtaken by evil, so they struggle to finish their respective books, leaving their writings for generations of people after them. There are two main themes in the film that are very relevant in today’s culture. Number 1, evil is all around us. It can manifest very suddenly and without cause. We see that weekly (or more often…) in the news, especially things like school shootings. Number 2, and the main lesson to learn from Paul and Luke: God’s love is the only answer. I’m also excited that Paul is getting a nationwide release; often, these types of films don’t come to my area. (We don’t have a small population here in the Portland area, but we’re not as big as NY or LA, so we often get skipped.) To see if the film will be in a theater near you, the movie website has a spot for you to enter your zip code and it will pull up locations and showtimes (it opens tomorrow, March 23, 2018). If it is near you, you can buy your tickets from there too. Disclosure (in accordance with the FTC’s 16 CFR, Part 255: “Guides Concerning the Use of Endorsements and Testimonials in Advertising”): Many thanks to Propeller Consulting, LLC, Collide Media Group and Columbia TriStar Marketing Group, Inc. for providing tickets to see the movie on its release in exchange for this promotional post. Opinions are 100% my own and NOT influenced by monetary compensation.